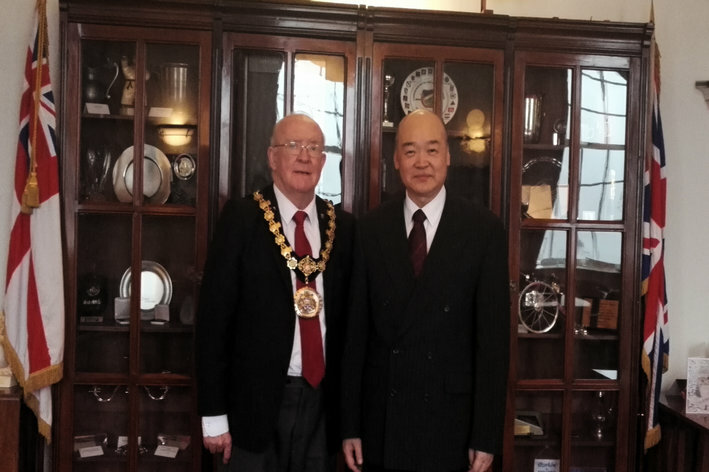 Consul General Dr. Sun Dali met and dined with Councillor Peter Connor, Ceremonial Mayor of Salford at Salford City Council upon invitation on Dec. 18, 2017, accompanied by Consul Lyu Xiaomei. Councillor Connor thanked Dr. Sun for his invitations to many events, which he said had enhanced his understanding and knowledge of modern China. He anticipated more opportunities from the Consulate for Salford businesses to engage with Chinese companies and more activities to be held as well as help with local Chinese language education so as to strengthen Salford’s China link. Dr. Sun complimented Councillor Connor’s proactive approach to engage with China. He noted that the bilateral cooperation would have very bright prospects with Chinese economy stable and improved,China-UK relations further consolidated and the‘Belt and Road’construction advancing in further depth. He called on Salford to seize on opportunities by fostering a friendlier environment to promote China-UK cooperation.